This function is an additional driving aid. However, the function does not take the place of the driver. Cruising speed activation, storage and increase switch (+). 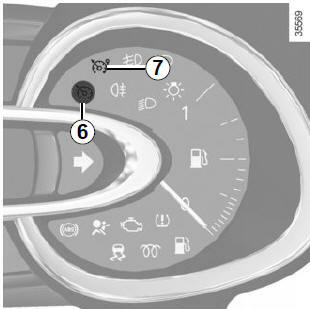 Activation with recall of saved cruising speed (R). Switch the function to standby (with cruising speed saved) (O). Press switch 1 side . Important: you are nevertheless advised to keep your feet close to the pedals in order to react if necessary. switch 3 (-) to decrease the speed. 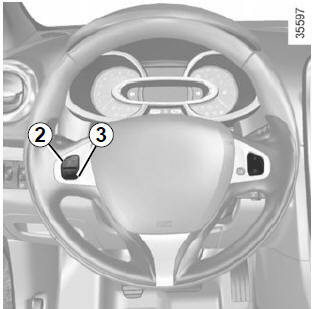 depress the clutch pedal or shift into neutral if the vehicle has an automatic gearbox. In all three cases, the cruising speed remains stored and the message “MEMORISED” appears on the instrument panel. Standby is confirmed when indicator light goes out.